It&apos;s been seven years since Chronic Wasting Disease was first discovered in Wisconsin&apos;s deer herd. It&apos;s a problem that continues to haunt the DNR, according to big game manager Keith Warnke. He says the agency is still not confident that the disease is contained to southern Wisconsin. Warnke says they still have a lot to learn in how to manage and prevent it from spreading further into the state. 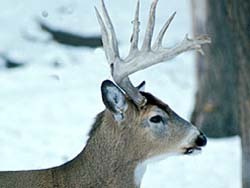 It was February 28, 2002 that three deer in the Mount Horeb area tested positive for the fatal brain disease. Since then, the state has spent millions of dollars hoping to stop its spread. Special CWD zones have also been set up to get more hunters out there to harvest deer in areas where it&apos;s known the disease is present. Warnke says the battle to contain and eradicate the disease continues to be a top priority for the DNR.